Shannon McElvaney, the first graduate of the PSU Masters in Geodesing program, writes about how his capstone project helped turn arond a planning process in his own back yard. Check out some exciting curated videos on Geodesign. Also find links to all of our social media accounts. In the upcoming 2019 ESRI Geodesign Summit, attendees will get a look at what is next for Geodesign. Geodesign is a cutting-edge land design and planning method which couples the creation of design proposals with impact simulations informed by geographic contexts, data, and systems thinking, all of which is supported by digital technology (1). Geodesign is the term for a modernized design process that evolved over several decades of refinement by experts, and it is having an impact worldwide. The originators of the term Geodesign advocate a process involving true collaboration among designers, scientists, technology/ data experts and stakeholders. Here’s a cool thing about Geodesign: once you learn this unique design process, it can be applied to a wide variety of issues and settings. 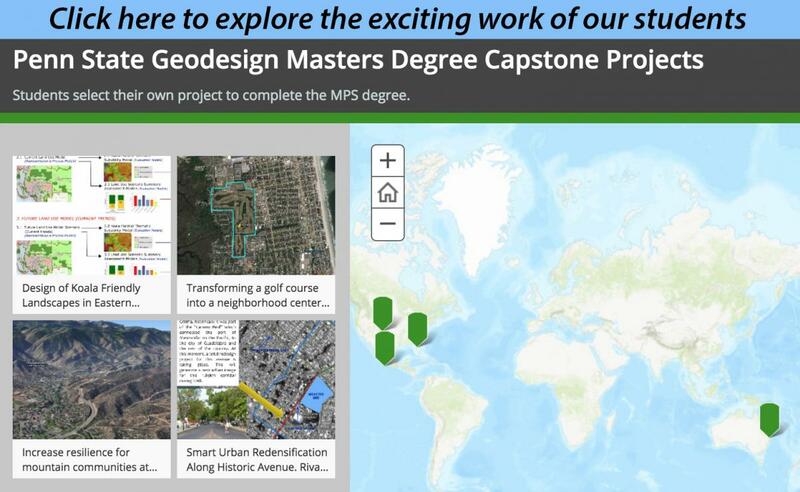 Check out 15 examples from across the globe that illustrate the geodesign process. These are examples of effectively using geodesign -- each one: sought input from collaborators; used geospatial technologies; created plausible design solutions for complex challenges. Designing land-based projects that are sustainable present challenges due to all the factors involved, such as land costs, conservation issues and energy concerns. Today, it takes contributions from multiple professions as well as local stakeholders to achieve successful design solutions. This trend is resulting in double-digit growth in professions involved in design and planning, according to the U.S. Bureau of Labor Statistics. Penn State’s Graduate Programs in Geodesign are delivered entirely online to prepare professionals to lead complex sustainable design and planning projects. Resources for more information about Geodesign.